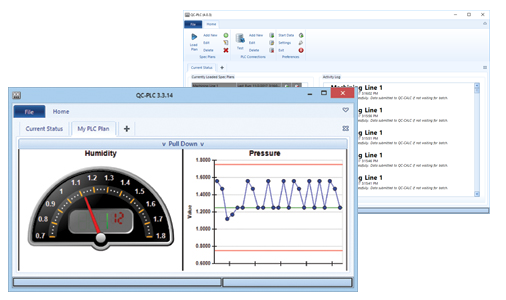 QC-PLC is an application that collects data directly from the registers on the Programmable Logic Controllers on your shop floor and sends the data directly to QC-CALC Real-Time. You can collect data either on a time interval (such as every 5 seconds) or based on an event (such as the changing of a value or flag inside the PLC). It currently supports about 90% of the PLCs in the market and each copy of QC-PLC can collect data from several PLCs since it is ethernet based. QC-PLC works by communicating directly with your PLCs via an ethernet connection. You simply choose the model of your PLC, add the IP address, and create the connection. Once you have a connection to a PLC, it can be used in spec plans. Each spec plan (like in QC-Gage) contains the trace fields (factors) and dimensions to be measured. The spec plans are then activated and run on the interval of your choice.